100WomenWhoCare is based on the simple concept of bringing together 100+ local women to make a large impact within their community. Join us! 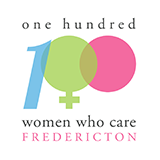 On April 11th we will come together to establish the 100+ WomenWhoCare-Fredericton Legacy Fund. All monies collected at this meeting will be entrusted to The Fredericton Community Foundation to create an endowment fund - forever giving, forever creating, the legacy. Come be part of this ONE time, incredibly inspiring and uplifting event. Even if you can't commit to the other meetings, this is the one to be at. Be part of the change, the legacy!